However, I'm really curious as which are the most important amongst them? Or is it even possible to guess the tide height if I know the Lunar phase and I have a good globe with sea depth? I don't know about the size of land masses, but their distribution and the shape of ocean basins definitely play a big role. When considering the ideal case of an all-ocean globe, i.e. one with no land masses (equilibrium tidal theory), the combined effect of sun and moon give a theoretical tidal range of less than 1 m(1). As tidal ranges can be much larger than this, there are other effects that has a greater influence. Another example of large tidal differences is the English channel, particularly the French side. In this case the tides are large at least partly because the tide moves as a coastal trapped Kelvin wave. 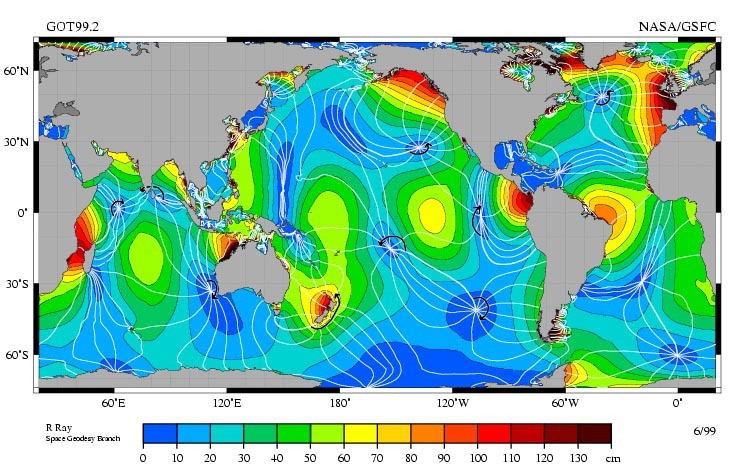 These are waves that propagate along land, with the land to the right when looking in the direction of propagation (on the Northern hemisphere, land to the right on SH). The amplitude of the wave is highest near the coast, decaying exponentially away from the coast. As the tide in the English channel moves northward, the largest tidal range is on the French side. With regard to guessing the tidal range, this is not entirely straight forward. First, when discussing tides, we generally split the tidal potential into a series of oscillations having different frequencies, mainly either diurnal (period of ~24 h) or semi-diurnal (period of ~12 h). These given frequencies are obtained through trigonometric considerations, and depend on the latitude of the point, the declination of the moon or sun relative to the equator, and the hour angle. (The hour angle is basically the longitudinal difference between the sub-lunar point and the point we consider.) Each of these components can vary in time and space. 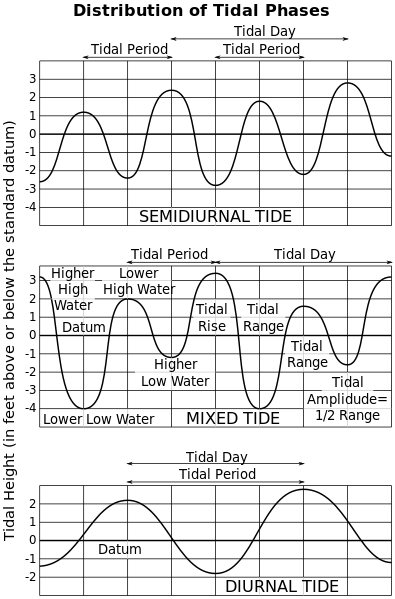 which shows the amplitude of the M2 tidal component. This is the strongest semi-diurnal tidal component caused by the moon. You'll notice that there are places where the amplitude is zero, i.e. this component causes no tides here. These are known as amphidromic points. (1) Pugh, David T. (1987) Tides, surges and mean sea level, chapter 3. Not the answer you're looking for? Browse other questions tagged ocean oceanography sea-level tides or ask your own question. What is the appropriate vertical datum to use globally? What causes these odd-looking currents in the Tasman Sea? How will sea level rise be distributed across the globe? Can tides at night by consistently higher than in the daytime?